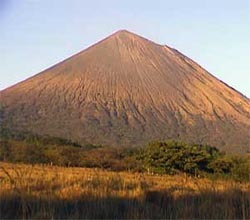 San Cristóbal volcano, new also as "El Viejo" or "Chichigalpa", is located Chinandega department. San Cristóbal his 1745 meters hight , the hightest of Nicaragua and its crater diameters is 500 meters. The name of El Viejo, was changed by the spanish to "San Cristobal" according to the strategy of colonization that plan to cancel the customs, traditions and name used by the natives. The San Cristobal is a very beautiful volcano for his perfect profile and the conic form of his crater. The San Cristobal is part of the famous "cinturon de fuego" (fire belt) that cross the country starting from the volcano Cosigüina and ending with the two volcanos of the Ometepe's island; this is the reason why the Nicaragua is called land of lakes and volcanos.